Home › entertainment › videos › Spoiled Great Dane Can’t Handle Being Ignored. His Tantrum Has Mom And Dad Cracking Up! Spoiled Great Dane Can’t Handle Being Ignored. His Tantrum Has Mom And Dad Cracking Up! Sometimes little kids can get a case of jealousy when a sibling or friend gets more attention from mom or dad. As it turns out, human children aren’t the only ones who have this experience! So do dogs, especially this Great Dane named Dinky! 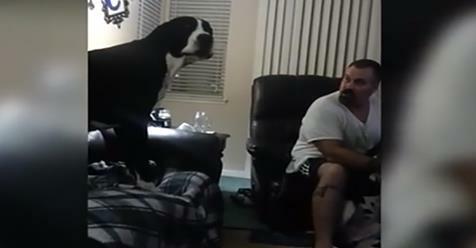 Dinky the Dane throws a total temper tantrum from the couch when his daddy gives more attention to a sibling than to him… And it’s absolutely hilarious! Great Danes are known to be dog that are “lovable, bumbling giants generally causing mayhem,” according to Rover. Well if that’s the case, then Dinky fits right in with the stereotype… Loving, bumbling, and SPOILED! Dinky’s dad, who regularly uploads videos of Dinky to YouTube, titled the video below “Spoiled Rotten.” We see what he means! Dinky really sounds more like a bear than a Dane as he whines (growls? rawrs?) from the couch while his brother, Romeo, gets attention. But Dad insists he wait his turn. “I can give Ro-Ro lovies, too!” Dad says to Dinky. “You’re just tired and crabby. It’s okay for me to love Ro-Ro.” It looks like the two of them are having an actual conversation! And Dinky has a lot to say. Watch this hilarious and entertaining canine hissy fit in the video below, and don’t miss the hilarious diva moment at 1:40!